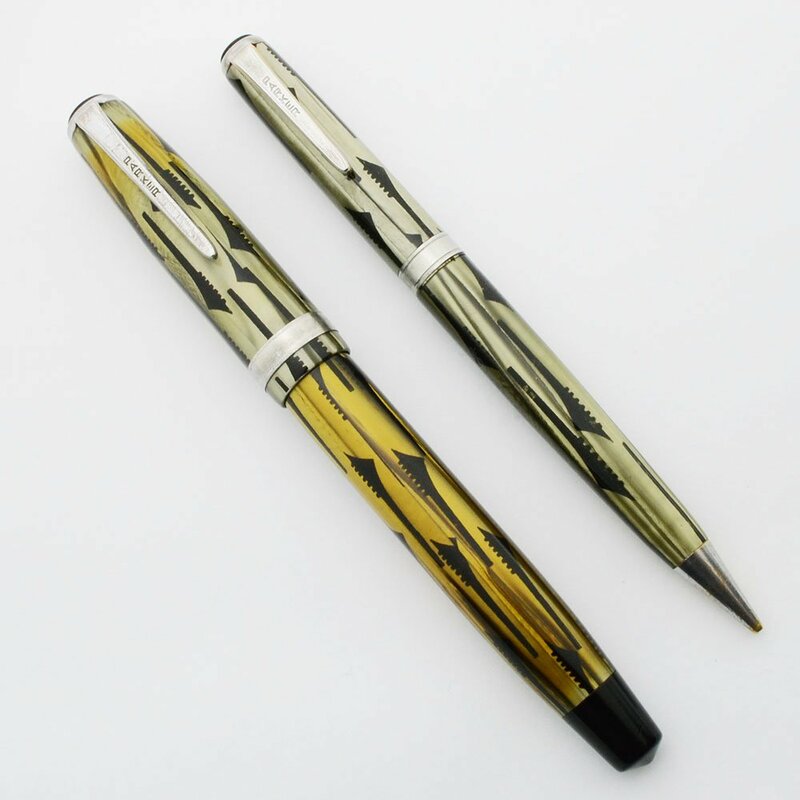 Parker Duofold pen set from circa 1940, from the Geometric line. The Geometric line is the model between the Duofold and the Duovac and was only produced from 1939-40. This is the gray "toothbrush" patterned version. 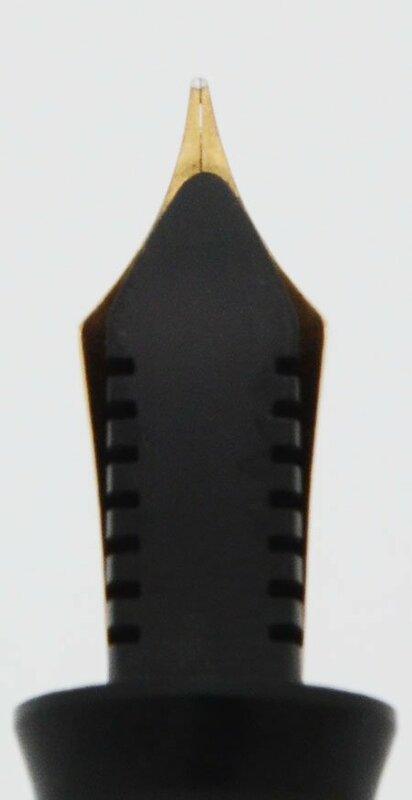 The fountain pen is a button filler with a black cap jewel and a just under 3/16" cap band. Extra fine gold nib is smooth. The pencil takes 0.9mm leads. Excellent condition set with trim wear and discoloration. Product Name Parker Duofold Geometric also called "Toothbrush". These were all button fillers. This is the non-patterned version, less common than the ones with the toothbrush design. Manufacturer and Year Parker, made in USA -- 1939-40 (The barrel date code on the pen is a clear 9 with no dots and the code on the pencil is a clear 0 with three dots. Both match the production years of this model). Length The fountain pen is 5-1/8", this pen came in two sizes: slender (aka junior) and standard. The Juniors were around 4-11/16" long so we are confident this is the standard full size pen. The pencil measure 4-5/8". Filling System The fountain pen is a button filler. We restored it with a new sac and it's working very well. The pencil takes "thin" or 0.9mm leads that extend and retract via a twist mechanism. It is working well. Color This is the "Gray Toothbrush," design. A slightly green pearlescent gray pattern with nickel plated trim. The fountain pen has a visiometer (partially clear section) to make the pen look like a vacuum filler when it isn't. Both pieces have a black cap jewel and a somewhat wide cap band with an etched line border. 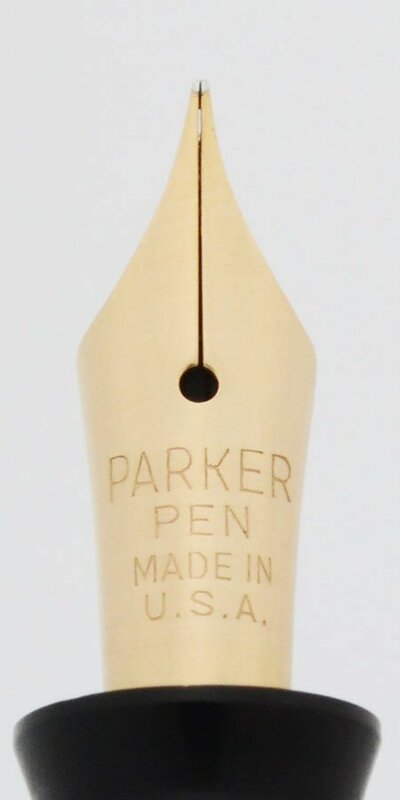 Nib EXTRA FINE gold Parker Pen USA nib is smooth with nice tipping material and a slight springiness. There is a dent on the feed. Condition Excellent condition with very smooth and shiny plastic. Both pieces have plating wear. 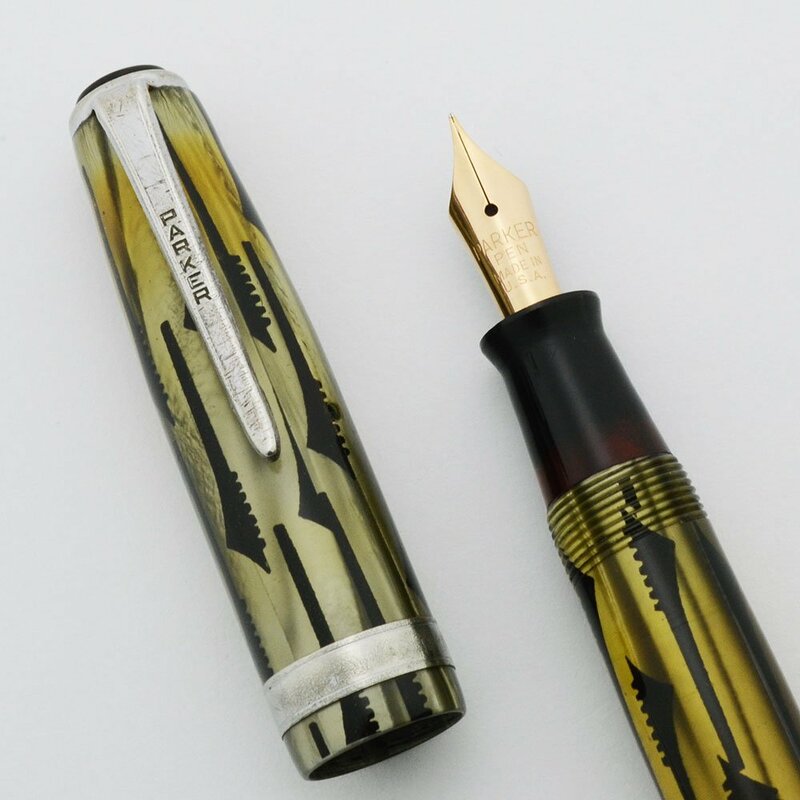 The fountain pen is discolored and is very yellow. There is a slight indentation in the pen cap and the cap band is covered in fine scratches. The pencil is in much better condition, but the pencil cone is quite brassed. Both pieces have very clear barrel imprints and no major scratches. No cracks or chips. It's very hard to find these without cracks in the cap lip, but we examined this set closely and found no cracks, though the lined pattern can be deceptive.